When we remove animals or birds from homes whether it be from an attic or a crawlspace under the home, we want to know 2 things; How did the animal get in? and How can we prevent the problem from re-occurring? 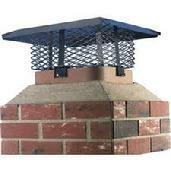 Most animals and birds gain access into structures thru rooftop vents, eves and chimneys. So once we remove the problem animals the first thing every homeowner wants to do is repair the animals entry point and stop the problem from happening again. And that is exactly what we specialize in, we can install heavy screening over vents, chimneys and crawlspace entrances. We can custom fabricate and install this screening over just about any opening imaginable. All of our installed screening is non-corrosive and galvanized against rust. It is installed in a manner that allows for easy removal by the homeowner, but not by an animal. Our work is guaranteed to keep the critters out of your home! One of our most common calls during the warmer summer months is snake removal, or more specifically Rattlesnake removal. And the first question we're asked is "what can I do to deter Rattlesnakes?" And our answer to that is snake proof your backyard. We can inspect your backyard and locate possible entry points for snakes into your yard. Once we have located all the entry points, we can effectively begin to seal and proof your yard by eliminating those entry points. We can repair cracks and holes in walls and fences. We can install a screen barrier over view fences which will allow you to keep the view, but will prevent snakes from slipping thru the bars and into your backyard. Another common entry point is under entry gates into your backyard, for this we install custom fabricated gate sweeps. Our snake proofing system has been proven to be highly effective at keeping snakes out of backyards, and it will give you the peace of mind that you have taken steps to help protect your family and pets against an unexpected run-in with a Rattlesnake in your backyard.